Once a month, my regular bread-baking column on Serious Eats turns into Knead the Book, where I review a bread-baking book, bake five loaves of bread, and write about it. 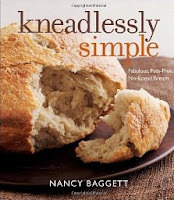 This month's book was Kneadlessly Simple by Nancy Baggett. I never really jumped on the no-knead bandwagon when everyone else was proclaiming it the best thing since ... uh ... sliced bread. I tried a few loaves and I like the concept - sometimes. But I knead a lot more than I no-knead. This book, originally released in 2009, uses a different version of no-knead. The one that no doubt increased the sale of Dutch ovens requires very little handling. Nancy Baggett's version using a lot of "vigorous mixing" that sometimes skirts on the edge of kneading. But still, actual kneading is not required. No matter what you call the mixing, the method is different - the breads I made all required a very long first rise at room temperature. It's a method I'm going to keep in mind for my own use. This is one of the breads I made for the column. The recipe calls for white cheddar, but I used yellow. I like the way it looked, with the bright yellow splotches. The Hispanic influence on American culture over the past decades has been pervasive and shows up not only in the popularity of Mexican and Tex-Mex fare, but also in the widespread availability of ingredients like assorted chiles. FIRST RISE: In a large bowl, thoroughly stir together the flour, sugar, salt, and yeast. In another bowl or measuring cup, whisk the oil into the water. Thoroughly stir the mixture into the bowl with the flour, scraping down the sides until the ingredients are thoroughly blended. If the mixture is too dry to incorporate all the flour, a bit at a time, stir in just enough more ice water to blend the ingredients; don’t over-moisten, as the dough should be stiff. If necessary, stir in enough more flour to stiffen it. Brush or spray the top with oil. Cover the bowl with plastic wrap. If desired, for best flavor or for convenience, you can refrigerate the dough for 3 to 10 hours. Then let rise at cool room temperature for 15 to 20 hours. If convenient, stir the dough once partway through the rise. the cheese and chiles. Fold them in very thoroughly to ensure they are evenly distributed . If necessary, thoroughly stir in enough more flour to yield a very stiff dough. Using a well-oiled rubber spatula, fold the dough in towards the center, working all the way around the bowl. Invert the dough into a well-greased 9 × 5-inch loaf pan. Evenly brush or spray the dough top with oil. Using well-oiled kitchen shears or a serrated knife, make a G-inch-deep slash lengthwise down the center of the loaf. Cover the pan with nonstick spray–coated plastic wrap. LET RISE USING ANY OF THESE METHODS: For a 1 1/2- to 2 1/2-hour regular rise, let stand at warm room temperature; for a 1- to 2-hour accelerated rise, let stand in a turned-off microwave along with 1 cup of boiling-hot water; or for an extended rise, refrigerate for 4 to 24 hours, then set out at room temperature. Continue the rise until the dough nears the plastic. Remove it and continue until the dough reaches 1/2 inch above the pan rim. BAKING: Reduce the heat to 400ºF. Bake for 30 to 40 minutes, until the top is nicely browned; cover the top with foil as needed. Continue baking for 20 to 30 minutes longer, or until a skewer inserted in the thickest part comes out with just a few particles clinging to the bottom (or until the center registers 204º to 206ºF on an instant-read thermometer). Then bake for 5 minutes more to be sure the center is done. Cool in the pan on a wire rack for 10 minutes. Turn out the loaf onto the rack; cool thoroughly. in plastic or aluminum foil. The bread will keep at room temperature for 2 to 3 days, and may be frozen, airtight, for up to 2 months. CHEDDAR AND PIMIENTO BREAD—Omit the green chiles and substitute an equal amount of well-drained and patted dry chopped jarred pimientos. Otherwise proceed exactly as directed.